Adjacent to the Southern Taiwan Science Park, just south of Shanhua, Tainan City in southern Taiwan, the World Vegetable Center headquarters campus covers a 117-hectare area containing research fields, laboratories, glasshouses, administration buildings and accommodation for international staff, students and guests. Most of the Center’s experimental work is conducted at headquarters, where approximately two-thirds of our staff are based. 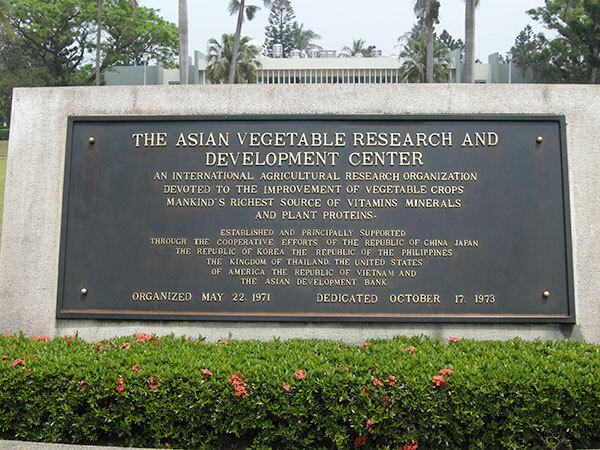 The Asian Vegetable Research and Development Center headquarters campus in Shanhua, Taiwan was dedicated on October 17, 1973. Now known as the World Vegetable Center, the organization has regional offices in Thailand, India, Tanzania, Mali and Benin. The research farm comprises 100 hectares of flood irrigated research fields, including 5 hectares that are nationally certified for organic production and 6 hectares nationally certified for biotech crop research. A flood mitigation program in conjunction with the neighboring Science Park secures the farm from storm damage. The Center is equipped with 40 nethouses mainly used for regeneration of genebank accessions and 72 glasshouses for year-round crop production. A secure negative pressure high-tech glasshouse is available for biotech research. The Center produces its own compost for use experimental use. Labs include equipment for specialized research in chemistry/biochemistry, nutrition, microbiology, molecular biology, entomology, plant physiology and soil science. Special facilities include an insectory, High Performance Liquid Chromatography, Near Infrared Spectroscopy, Gas Chromatography, freeze-drier, image analyzer and facilities for the analysis of essential nutrients and phytocompounds. Separate rooms are used for tissue culture, staining, electrophoresis and the handling of radioactive materials. An animal room and cell culture room are also available for nutritional and functional studies. Standard procedures for DNA extraction of several plant and microbial species are used. The biotechnology laboratories consist of dedicated DNA, RNA, molecular marker and transgenic laboratories. Facilities include PCR and real time PCR facilities with robotics for fully automated sample preparation. Li-cor sequencers are available for SSR (simple sequence repeat) and AFLP (amplified fragment length polymorphic) marker analysis. A PCR-based SNP (single nucleotide polymorphic) marker genotyping facility is also available. Virology has well equipped laboratories for the serological and molecular detection, identification and characterization of plant viruses. There are also insect-proof glasshouses, screen houses and growth rooms where mechanical and vector transmission of plant viruses is routinely performed to indicator test plants as well as for screening germplasm and breeders lines for resistance to important virus diseases. The world’s largest public collection of vegetable germplasm is housed in the World Vegetable Center Genebank. Two long term storage units with a total floor area of 52 m2, kept at -10 to -15 ºC contain orthodox vegetable seeds, and there are six medium-term storage rooms with a total floor area of 96 m2, operating at 5 ºC and 40-45% RH, and one short-term storage with a floor area of 105 m2, operated at 15 ºC and 40% RH. Vegetables that are vegetatively propagated such as shallot and garlic are maintained as living plants in field genebanks, and there is a tissue culture laboratory for in vitro conservation of germplasm and embryo rescue activities. The World Vegetable Center Library, located within the main lab building, offers a collection of more than 1500 journals, 12,000 monographs and almost 16,000 crop publications. The Library Online is accessible to all Center researchers and other users.